Kryžių Kalnas ("the Hill of Crosses") is a site of pilgrimage about just north of the city of Šiauliai, in northern Lithuania. The exact origins are unknown, but it is considered that the first crosses were placed on the former Jurgaičiai or Domantai hill fort after the 1831 Uprising. Over the centuries, not only crosses, but giant crucifixes, carvings of Lithuanian patriots, statues of the Virgin Mary and thousands of tiny effigies and rosaries have been brought here by Catholic pilgrims. 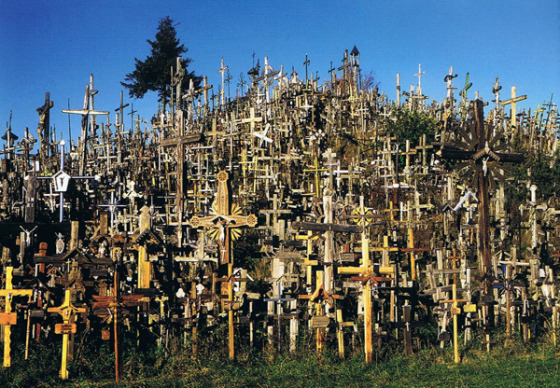 The number of crosses is unknown, but estimates put it at about 55,000 in 1990 and 100,000 in 2006.